The medieval town of Casale Marittimo is contained within an ancient wall located on a hill a few miles distant from the sea of the Tuscan coast. Point of view consists on an approach to the architectural, historical and landscape context of Casale Marittimo in which the notion of time and temporality constitutes the essence of the work. An observatory- piece that emerges from the landscape to define a new place through a cyclical route: on one hand Point of view invites to a route towards the fixation of the moment facing the perception of the surroundings, and on the other hand, a parallel time defines the cycle of transformation of the piece in which the process of change determines the physical conception of the work. Itinerary: Walking by the ancient Roman road that joins Casale Marittimo with Casalevecchio (Etruscan historical site, original foundation of the town) it is possible to observe on the top of a small hill a massive volume formed by rows of straw; Approaching to the piece, the observer discovers how the volume is transformed into a perspective space formed by two walls that invite to be crossed. Fixedness: Entering and crossing the piece, the perception of the landscape changes: the visitor listens and feels each step walked over the matter. At the end of the piece a step invites to have a higher point of view from which it is possible to observe the medieval town of Casale Marittimo, its direct relation with the Tyrrhenian coast and the islands of the Tuscan archipelago: the islands of Elba, Capraia and Gorgona. 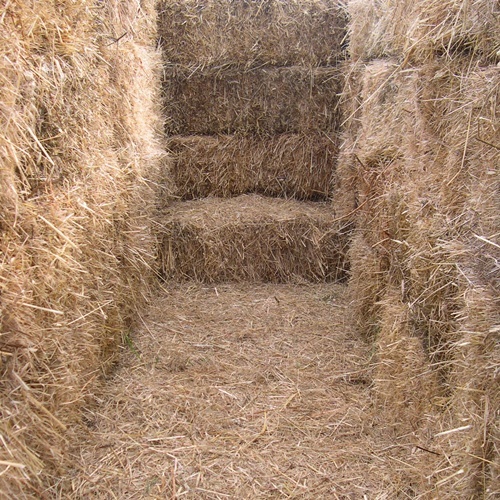 Interior: A new perception occurred when the step is used as a seat in which the spectator stays in between the straw walls, isolating himself visually from the ample horizon; the glance goes towards a fragment of landscape framed by the piece, from that point it is possible to perceive the scent of the matter the sound of birds and the run of the wind. Since its conception, the project Point of view, was closely joint to the surroundings that lodged it. During the development of the project Iván Juárez, had the possibility of developing a daily confrontation with the context and its habitants, who collaborated actively during the process of the work. 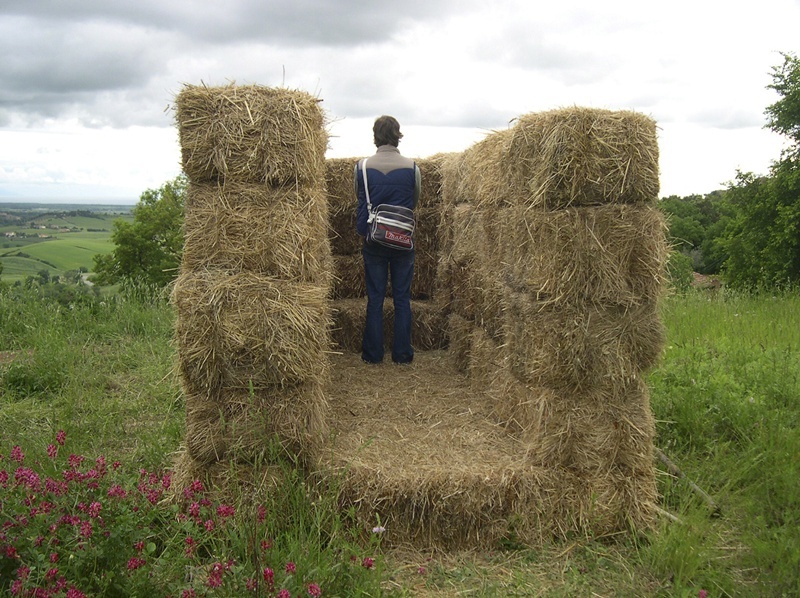 The project used a material consisting of sun dried grass, material used as food for the cattle of the site, the material did not have to be transported from another site but was obtained from a neighbor farm. The facility that supposes to use these blocks directly from the place where the project locates, represents a level of mimesis with the surroundings. Comune di casale Marittimo dala provincia di Pisa, Tra art regione Toscana.